wishes all women in the world a Happy Women’s Day. Please be informed that Alpha Specialist Centre is operating as usual today – (19/10/2017). We are truly sorry for the inconvenience caused. Please be informed that Alpha Specialist Centre will be closed on the 9th September 2017, Saturday in conjunction with the birthday celebration of Yang di–Pertuan Agong. Our Specialist Centre will resume operation on Monday, 11th September 2017. Thank you. Alpha Specialist Centre will be closed on the 31st August 2017, Thursday and 1st September 2017, Friday in conjunction with Independence Day and Hari Raya Haji. Our specialist centre will resume operation on 2nd September 2017, Saturday. On behalf of the management, wishing you Happy Independence Day and Selamat Hari Haji 2017! Please be informed that Alpha Specialist Centre will be closed on the 12th June 2017, Monday in conjunction with Hari Nuzul Al-Quran. The clinic will resume operation on 13th June 2017, Tuesday. From now until 30 November 2017, Standard Chartered Bank Credit/Debit card holders can enjoy 25% off our Endoscopy Package. The above promotion is not applicable with any other on-going promotion, discount or privileges. Payment must be made through any Standard Chartered Bank Credit or Debit Card to enjoy these offers. Sign up now for our Alpha Wellness Card and enjoy 10% discount on our Endoscopy Packages. For more information, please refer to the poster above. Please call 03-61418533 for appointment. This promotion is valid until 30 November 2016. Price stated includes 6% GST. Alpha Specialist Centre reserves the right to remove this promotion without prior notice. From now until 31 May 2016, enjoy 10% discount on our basic health screening package when TWO ladies come in TOGETHER. That’s right ! Invite your Mom, Mom-in-law, Daughter, Daughter-in-law, Aunt, Sister, Cousin, Neighbor, Baby-sitter or your BFF to enjoy this limited offer. Bonus: Receive a FREE ASC Wellness Card which offers savings of between RM 60-RM 150 for future visits. This promotion is valid until 31 May 2016. Promotion is only valid for those who come in pairs ie. 2 friends / couples / mother & daughter / daughter & dad, husband & wife) where both persons need to be screened at the same time. Discount is not applicable if the individual is alone. Between 1 October 2015 – 31 October 2015, we are offering discounts for breast screening. Please click on the ad above for more info. Awareness alone is not enough. Act now before it’s too late. If you intend to get your health checked this year, why not grab this chance. Drop by on that day and sign up with us. You can come on another day to do the screening. Once you have purchased, call our HSC Department at 03-61418533 for appointment. Please utilize by 23 November 2015. Join us on October 24, 2015 for Public Health Talk on ” Psoriasis and Your Health”. Our Senior Consultant Dermatologist, Dr. Steven Chow will talk on the treatment and management of the disease. Admission is FREE. We are currently raising funds to support Breast Cancer Welfare Association Malaysia (BCWA). 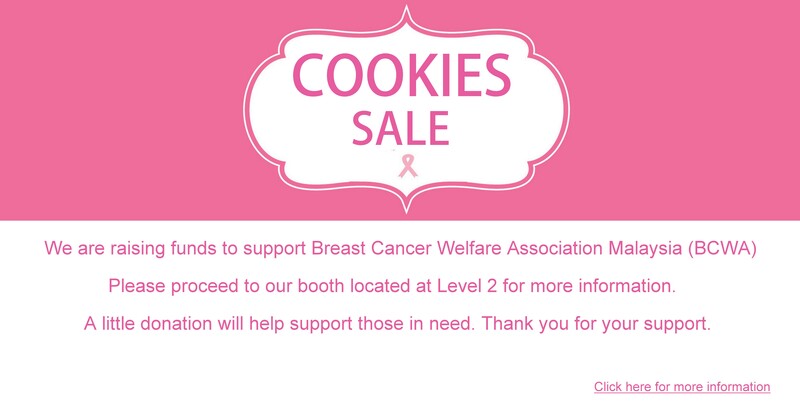 Our cookies for sale booth is located at Level 2 (same floor as our Specialist Clinics). Our cookies are priced at RM 20 per box. Please support us as a little donation will help those in need. Thank you very much. 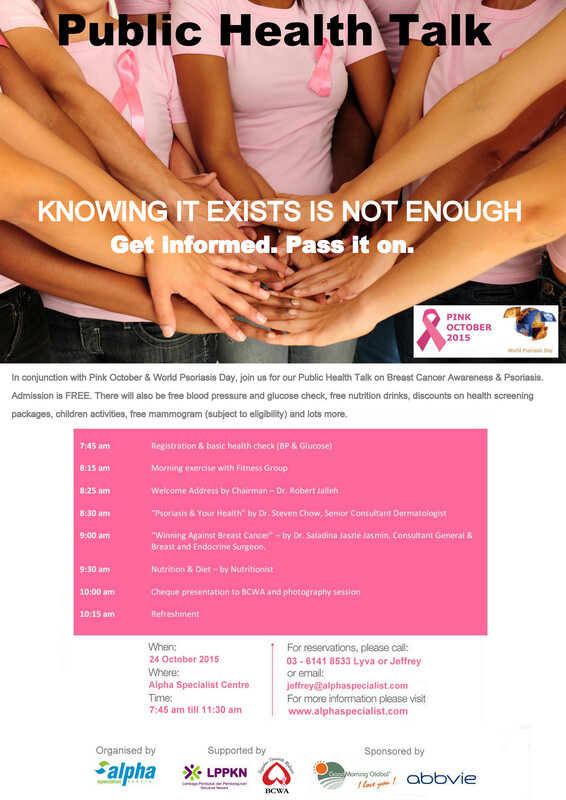 In conjunction with Pink October & World Psoriasis Day, join us for our Public Health Talk on Breast Cancer Awareness & Psoriasis. Admission is FREE. There will also be free blood pressure and glucose check, free nutrition drinks, discounts on health screening packages, children activities, free mammogram (subject to eligibility) and lots more. We would like to welcome Dr. Lee Wei Wei as our New Consultant Ophthalmologist. Dr. Lee Wei Wei completed her basic medical degree from University of Malaysia in 2005. After her graduation, Dr. Lee worked as Medical Officer at Ministry of Health ‘s Hospital in Penang and GHKL until she joined the Ophthalmology Department, University of Malaya in July 2011. During this period, Dr. Lee continued her Specialist training and successfully completed her Master of Ophthalmology at University of Malaya in June 2013. 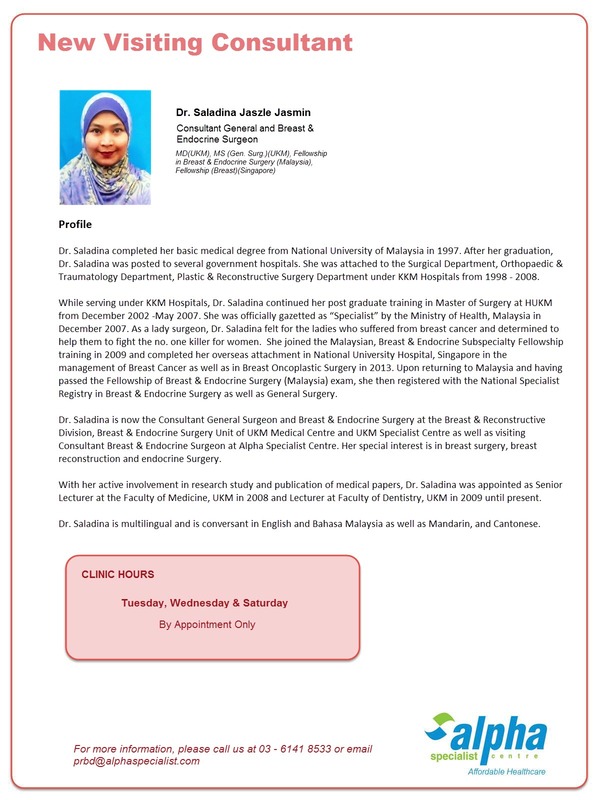 She was then gazzetted as Specialist doctor with effect from 1st July 2013 and promoted as Ophthalmologist at Tuanku Ampuan Najihah Hospital, Negeri Sembilan. Dr. Lee Wei Wei served the Negerian since then until she was posted back to Sungai Buloh Hospital in mid 2015. Besides practising as clinical Ophthalmologist, Dr Lee also actively involved in the teaching of medical students. She teaches the medical students at IMU, conducting CME, clinical & basic sciences teaching for Medical Officer at the Ophthalmology department and outpatient clinic. Dr. Lee Wei Wei also actively involved and community service and social activities. With her passion to help the unfortunate, Dr. Lee helps running the Charity Clinic at Pudu under Tze Chi Foundation. She also joined the Sitagu Missionary Association, Myanmar to perform charity Ophthalmology work (surgery & clinic) in few places in Myanmar in year 2014. Dr. Lee is multilingual and is conversant in English, Mandarin, Hokkien, Bahasa Malaysia and Cantonese. For appointments, please call 03 – 6141 8533. ASC would like to welcome our New Visiting Consultant General and Breast & Endocrine Surgeon, Dr. Saladina Jaszle Jasmin. As a lady surgeon, Dr. Saladina felt for the ladies who suffered from breast cancer and determined to help them win the fight against the disease. Dr. Saladina is multilingual and is conversant in English and Bahasa Malaysia as well as Mandarin, and Cantonese. If you have relatives or friends who are suffering from early symptoms of breast diseases, please refer to a Specialist as early detection saves lives. Alpha Specialist Centre ingin mengucapkan Selamat Datang kepada Pakar Runding Bedah Payudara yang baru, Dr. Saladina Jaszle Jasmin, Sebagai seorang pakar bedah wanita, Dr Saladina ingin mengunakan segala pengalaman beliau untuk membantu kaum wanita yang menghadapi kanser payudara supaya memerangi penyakit ini. Selain fasih dalam Bahasa Inggeris dan Bahasa Melayu, Dr Saladina juga fasih bercakap dalam Bahasa Mandarin dan Bahasa Cantonese. Jika anda mempunyai keluarga atau sanak saundara yang mempunyai tanda-tanda penyakit payudara, anda boleh merujuk kepada Dr Saladina. Kanser payudara boleh disembuhkan jika dikesan awal dan dirawat secepat mungkin. Sila hubungi kami di talian 03 – 6141 8533 untuk temujanji. Anda juga boleh mengikuti https://alphaspecialistguide.com/dr-saladina-jaszle-jasmin/untuk mengetahui jadual masa beliau. We are please to inform the joining of Dr. Subashini Chellappah Thambiah as the new visiting Consultant Metabolic Bone Specialist with effect from 14th November 2014 (Friday). She will be managing the Metabolic Bone clinic on every Friday from 2:30 pm – 5:00 pm. Our hand centre is a state-of-the-art facility conveniently located in Alpha Specialist Centre, Kota Damansara, Petaling Jaya, providing all forms of treatment and evaluation of the hand, wrist and upper extremity. Our values of compassion and concern for your particular needs are complemented by the professional expertise of our highly-skilled, board certified orthopedic surgeon. At Alpha Hand Surgery Centre, we know your hands are your livelihood and that’s the reason why we take particular care in providing the best, thorough treatment that will allow you to recover as quickly and confidently as possible. For more information, please visit http://www.alphahandcentre.com.